Once in a while, I have a rescue case that haunts me for a long time because of the outcome and the way I mishandled it. This is one of those rescues, and I wish I could do it all over again. Abby Kat is a 10-month old muted brown tabby girl who lives in a rural area with some gentle horses. She is comfortable with the horses, but one day they surprised her by running up near her. 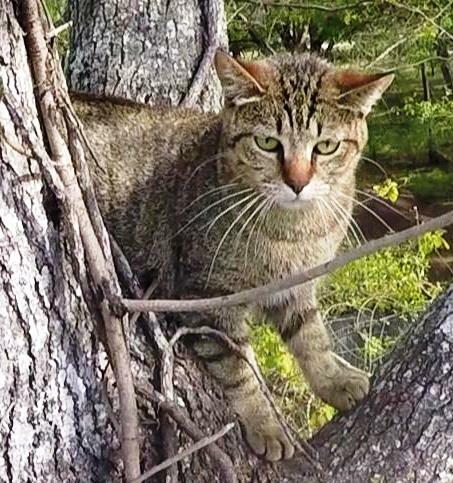 Abby Kat was so spooked by their unexpected appearance that she ran up a tree at the fence-line near their barn. She had been stuck there for two full days and nights when I arrived. As I worked to install my rope, I was listening carefully to Abby Kat's cries to determine if she was stressed by my presence and activity. She sounded fairly distressed, and I was concerned that she would not be a cooperative kitty. As I began climbing up to her, her cries continued to sound stressed, but her behavior suggested that she was comfortable. She was not climbing higher, she was not looking for other places to escape, and she even approached toward me slightly. Perhaps I was misreading her cries. When I reached close to her level, I reached out my hand to her, and she sniffed it without any sign of fear or distress. When I got even closer to her, she stayed in place and eventually allowed me to touch her. I rubbed her head and neck, and she pressed her cheeks into my hand while enjoying the contact. Abby Kat was going to be a cooperative kitty after all, and I was delighted. If Abby was going to be cooperative, then I preferred to bring her down in the large rescue bag because that is one of the least stressful ways to rescue her. I adjusted my position by her and prepared the bag. At this point my brain apparently stopped working. Up to this point, I had done nothing wrong, but I had not finished thinking through this rescue process. If Abby turned out not to be cooperative, then I had no back-up plan. 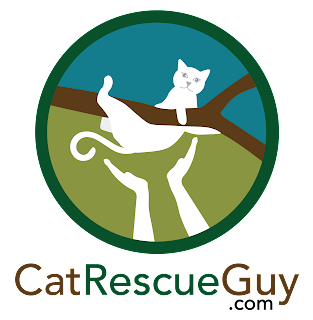 I had just rescued another cat where I was not sure how he would react once I scruffed him, so I prepared my gloved rescue bag on one hand in addition to the large bag. He turned out to be easy to stuff into the large bag, but if he had given me any trouble, I was already set to pull the gloved bag over him. So why did I not think to do that this time with Abby? I had assumed that Abby would be willing to be picked up and placed in my lap prior to stuffing her in the bag. I was grossly mistaken. 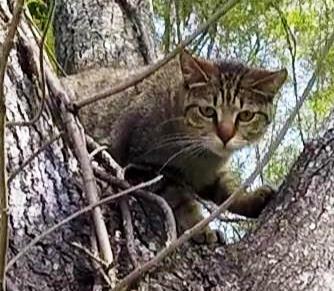 With all four clawed feet, she grabbed at the numerous vines lining the tree trunk, and now we were in a tug of war. Suddenly our amicable relationship had turned adversarial as I tried to pry her feet away from the vines and place her calmly in my lap. She was having nothing to do with this and struggled to get away. I was unable to get my hand in position below her chest while holding her front legs between my fingers so that I could stuff her into the bag head-first. I had to act fast and get her in the bag any way I could, but that is a difficult, if not impossible, task with four spread, clawed legs frantically grabbing onto everything they can find. When I was able to get her head into the bag, she especially reacted violently to that as if that was the most terrifying thing she could imagine. I was lucky that she did not try to bite me, but I felt I was just a few short seconds from that possibility. I was not in control of this cat, and the outlook for getting her into the bag was getting very grim. Sure enough, she finally freed herself enough to get a good jump, and away from me she flew. I watched helplessly as Abby fell from 35 feet high. About halfway down, she took a glancing blow on another branch. Once she reached the ground, she instantly ran off as fast as she could back to her house. Fortunately, the ground where she landed was very soft. The horses thoroughly loosen the soil daily, and recent rains had left it in a very soft state. I felt terrible. Abby's owner, Michelle, checked on her at the house and found her to be fine except for a small scratch on one ear. I was relieved to hear that, and I am never surprised to hear about a cat surviving a high fall. But that was certainly not the way I wanted Abby to go down, and I was very disappointed in myself for failing to rescue her safely and gently.